Even though I have a goal to travel to 30 countries by the time I turn 30, and I have been to many famous places, up until this year I had never been to one of the most famous cities of all: London. 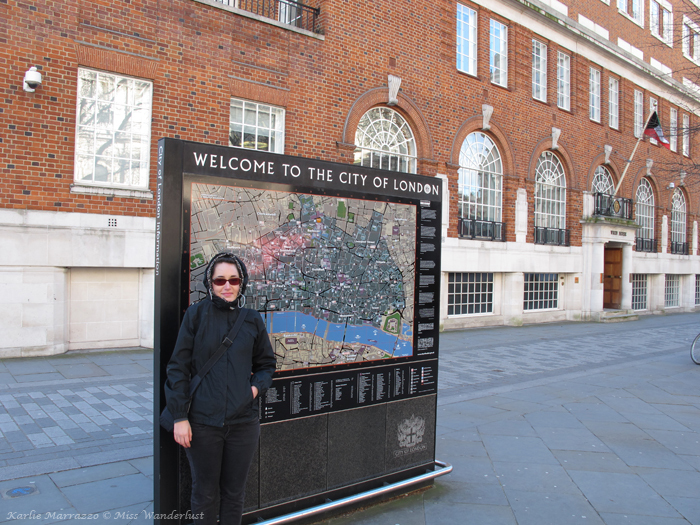 Combining London with a trip to Morocco might not spring to mind immediately, but when Dave and I had the choice of either a 13-hour or 24-hour layover, we decided to try the longer one and squeeze in as much of London as we could. Our flight from Lisbon was nearly empty, and we had a three-seat row all to ourselves. Because of this, we were also able to bring our big backpacks into the cabin as carry on, which would save us a lot of time after the flight. The day was already off to a positive start. 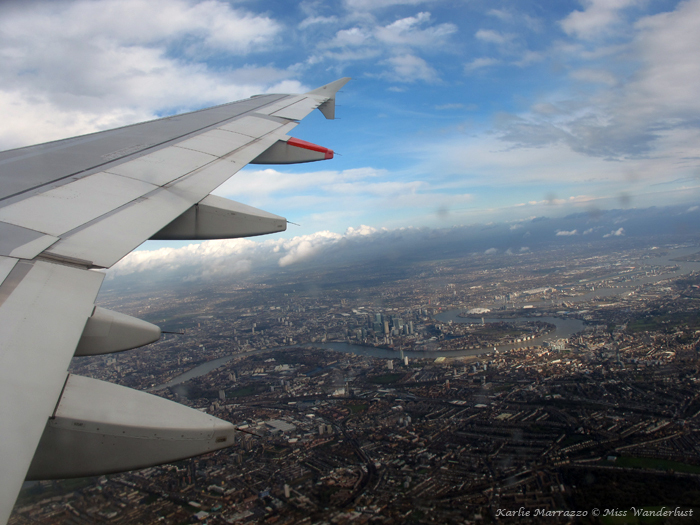 As we began the long descent into Heathrow, the famous London landmarks came into view – Big Ben and the Parliament building, the Tower of London and Tower Bridge, and the London Eye. It was such a freeing feeling to grab our bags from the overhead compartment and walk right off of the plane without stopping until we reached passport control. Our roll continued, beating the line to passport control and making it through within 10 minutes. We navigated through the airport to the Underground desk, purchasing two unlimited travel cards for £18 that lasted until the next morning. The card is a great deal if you’re planning on doing a ton of sightseeing like we were. 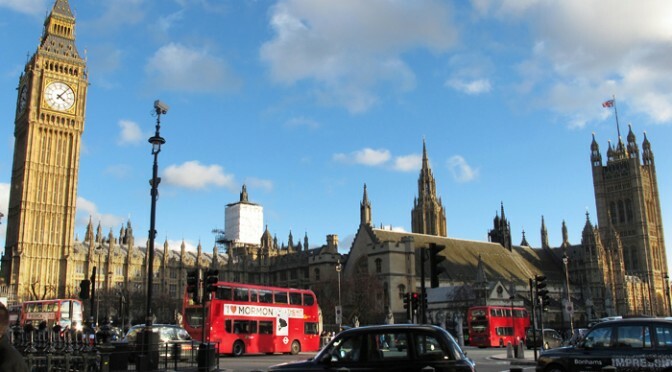 We planned our 25 hours very carefully to take full advantage of our time, choosing a hotel on the Picadilly Line, which runs directly from Heathrow and connects with many of the main tourist sights. From the time we got off of the plane to the time we walked into our hotel, only an hour had passed. We gave ourselves a pat on the back for that one, as it was even quicker than we expected. We stayed at the Premier Inn London Kensington, a perfectly generic hotel close to the Earl’s Court stop on the Picadilly Line. I love the smell of generic hotels – I find it so calming and comforting. Sometimes it’s nice to be in a completely plain, basic hotel room where everything is exactly as expected. Plus it had the bonus of a huge bathtub. We dropped our bags, quickly freshened up and walked right back out the door, grabbing lunch at Pret a Manger and chowing down on the Tube ride to save time. These are the sights we wanted to see, and we were able to see them all! Since we were on such a tight schedule, and due to the cost of many of the sights, we didn’t actually go in to any of them. It was £32 for both of us just to get into Westminster Abbey, which is a whopping $60 once you factor in the crappy exchange rate for Canadians. Add £44 for the Tower of London and £33 for St. Paul’s and we would have been looking at a couple of hundred dollars. It certainly would have been nice to go into at least one of them, but now that we have a taste of London, we’re looking forward to doing so on our next visit when we have more time. Even though we didn’t get the full scope of these amazing sites, we decided to make the most of the day and just be tourists, taking tons of silly pictures and hustling from one place to the next. Bad weather had been pummeling England right before we arrived, so we were incredibly lucky to have a gorgeous day to work with. 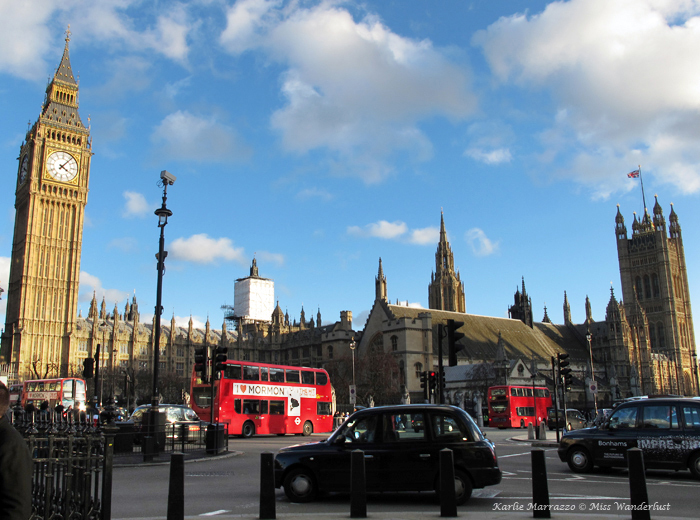 The sun was out in full force – for England in February – and the sky was bright blue. It was windy and there was a decidedly Canadian chill in the air. 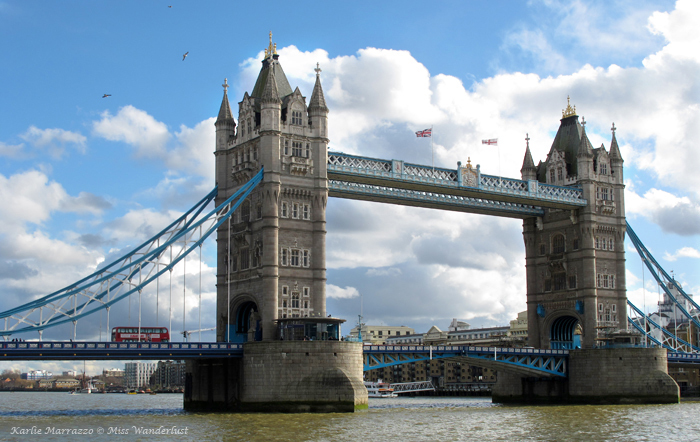 Our first stop was the UNESCO World Heritage Site Tower of London, alongside the iconic Tower Bridge crossing the Thames. The area was crawling with tourists and it was the first time in weeks we heard multiple languages aside from Arabic and French. I felt like I’d gone through a time warp and had been thrown into the future. 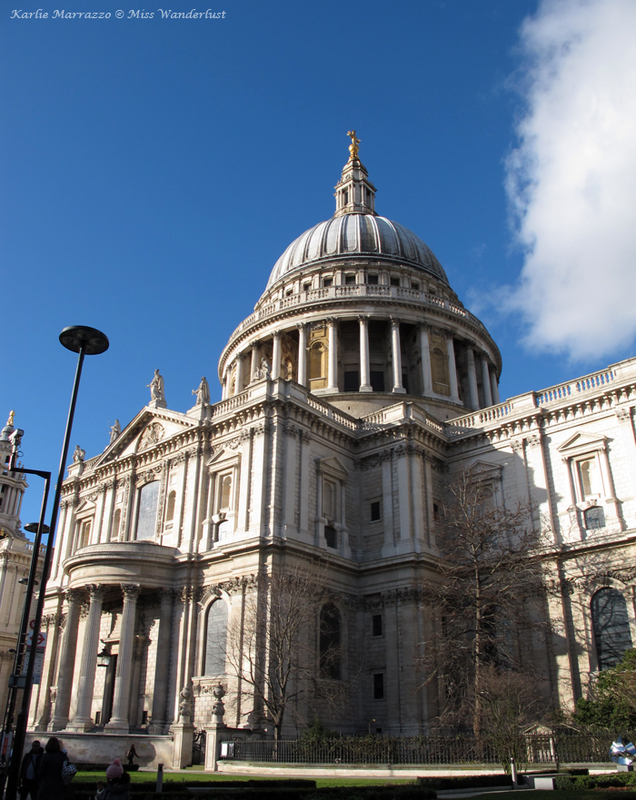 Next we took the Tube to St. Paul’s Cathedral, where Prince Charles and Princess Diana were married. I’ll be sure to make a proper visit next time I’m in London. I thought it would be a nice idea to take the bus to the next spot, Trafalgar Square, instead of the Tube. Why waste time in the ground? We took a regular city bus, the classic red double decker, instead of the Hop On Hop Off tourist bus. If you have the unlimited day pass and a map, you can create your own hop on hop off tour at a fraction of the price. We snagged a primo spot, right at the front on the top deck. The window was huge and we had an incredible view of the city streets all around us. I was completely stricken at how elegant and gorgeous the city is. London is one of those places that you feel like you know, even if you’ve never set foot in it, thanks to movies, TV, pop culture, musicians and more. But to finally be there myself, it was more than I even imagined. The part we were traveling through was so well kept and neat and tidy, very proper. I don’t think I saw one piece of litter anywhere on the ground. All of the cars were expensive, shiny and new. Of course London is a huge city and I know what I was seeing was not representative of the whole place, but I was still in awe. The countless mature buildings are immaculate, unlike other European cities, where the buildings are gorgeous but definitely looked lived in and show various states of wear. Trafalgar Square was next – the geographic centre of London, a huge public space covered in people, with a famous column surrounded by four lion statues, flanked by the National Gallery and topped off with an odd giant blue rooster sculpture. 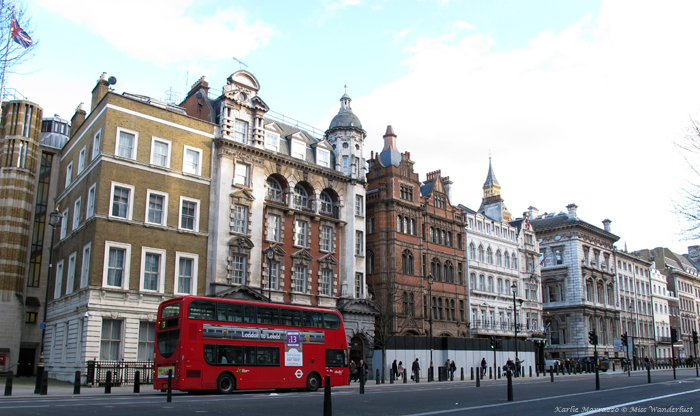 We walked down Whitehall, the centre of the government; a quiet street lined with historic buildings on either side, including the home of the Prime Minister, 10 Downing Street. As I walked down that spotless street, with its impeccable pubs and impeccable cars and historic monuments, my mind wandered to another world full of top-secret political meetings and dinner parties, a world that I’ll never know. The jewel at the end of the road was Big Ben and the Houses of Parliament. I knew they were going to be there, but they stunned me nonetheless. As we stood on the corner across the street, trying to get the perfect shot of a red double decker passing in front of the clock tower and taking pics of each other in front of it, there were two guys our age beside us making a video about all of the “annoying tourists” swarming their city. We caught a glimpse of the London Eye but didn’t bother going closer since we wouldn’t be riding it anyways. We crossed the street to Westminster Abbey, another UNESCO World Heritage Site along with the Palace of Westminster. My bones were getting cold, so I went into my favourite place, the gift shop. Dave saw a pristine 1950s Bentley in front of the Abbey, so he went to drool over it while I warmed up to Will and Kate gazing at me from every angle. Another 15-minute walk brought us to Buckingham Palace, the London residence of the Queen herself. I was surprised to see that it was the middle of a very busy traffic area with bustling roads all around. The Royal crest was flying high on the flagpole, letting all of us know that the Queen was currently staying at the Palace. I wondered if she was in there right at that moment, peeking out of the window from behind the curtain down at all of us. What does an 88-year old figurehead do at 5 o’clock in the afternoon on a Thursday? 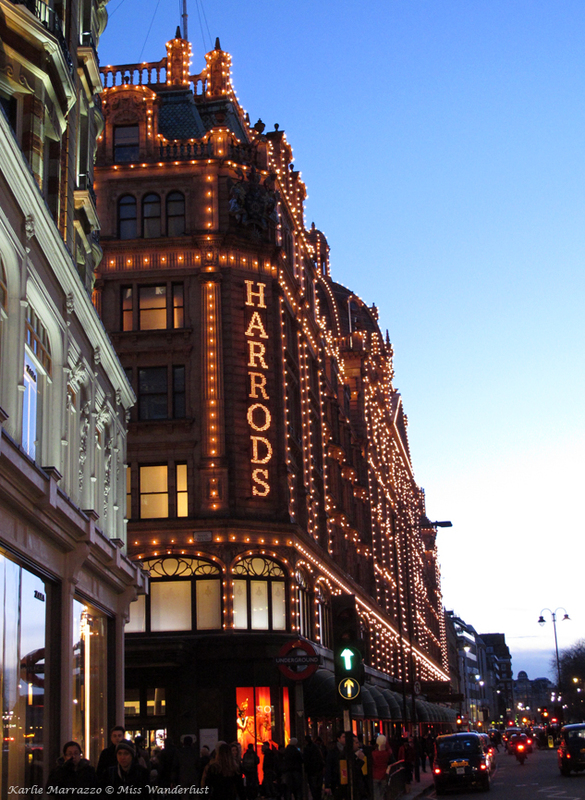 Having checked off all of the big sights we wanted to see that day, there was one small detour I wanted to make – Harrods. We emerged from the Underground station down the street from the store. Dusk was settling in and the iconic building looked so pretty covered in little twinkling white lights. I was planning to get some small things for myself and a couple of others, but as soon as I walked in I was uncomfortable and intimidated. I witnessed somebody drop £60 on chocolates and high-tailed it out of there. The final essential touristy thing we wanted to do was dine in a true English pub. Dave longed to experience his favourite food, Yorkshire puddings, in their native land, but we discovered that most places only serve them with roast on Sundays. There were so many pubs around our hotel that we didn’t want to end up with a dud, so we checked on Yelp and found one down the street called The Blackbird, whose specialty is pies. We walked in at 7 pm and snagged the last table in the place, near the back with all of the other tourists. There were just as many locals at the bar, too. They offered a pie and a pint special for only £10.95. I had a lamb pie and Dave had the house special pie, which was filled with steak. They came with thick cut chips, delicious covered in malt vinegar and steaming hot gravy, and salad. I’m not a huge fan of beer so I ordered a proper English cider as well. We had thought about staying up late and trying more pubs, and walking around the neighbourhood just to see more of London, but Dave was practically falling asleep at the table at 9 pm. Back at the hotel, he snuggled into bed while I enjoyed a steaming hot bath. We didn’t have to be at the airport until 10:30am, which gave us lots of time for breakfast and to write and send out postcards. We hopped back on to the Picadilly Line, and 38 minutes later we were at Heathrow, boarding our second last flight of the trip, destined for Calgary. After 19 days, 22,000 km, revisiting one of my favourite cities (Lisbon), traveling from one end of Morocco to the other and seeing ancient medinas, mountains and the Sahara Desert, and capping it off in one of the world’s greatest cities, we were going home. London is so fun to do as a tourist. It’s worth noting that a lot of the national heritage museums and art galleries are often free. That trafalgar square one can set you back a day or two on its own! Excellent point Hannah! 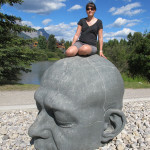 We were definitely shorter on time than on money for this stopover. I think I would need a full day for each of the museums and galleries. 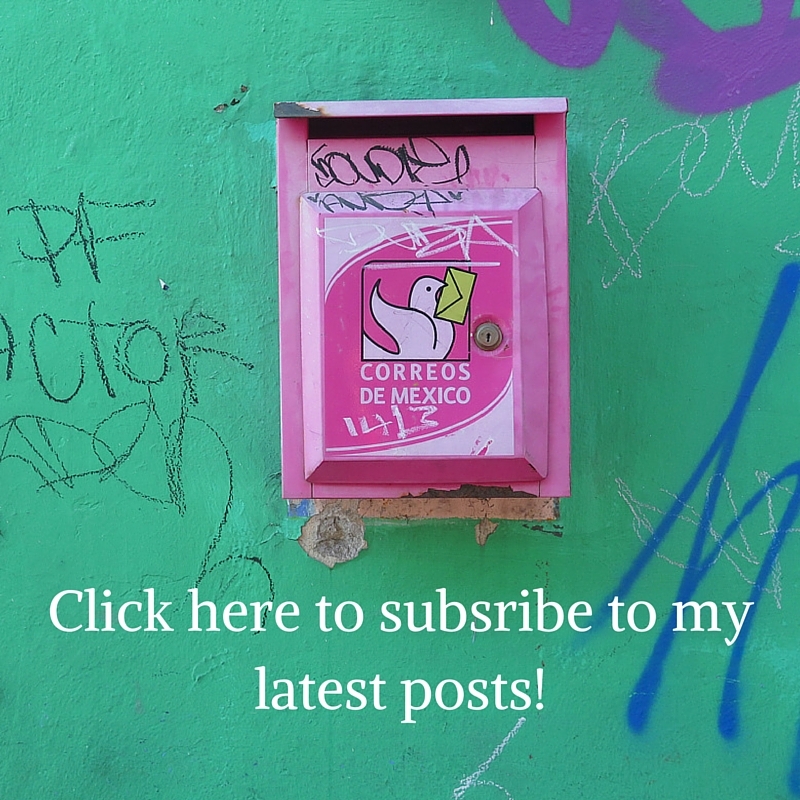 I really liked your blog, I’ll join it to my blog feed 🙂 Sadly we will be not able to read mine because it is in portuguese, but I can invite you to see the pictures, ahahah. And of course, if you need help when planning your return to Portugal, you can ask without hesitate. This was an excellent read! Thank you for the insights!